This topic contains 11 replies, has 6 voices, and was last updated by harry selent 1 year, 9 months ago. 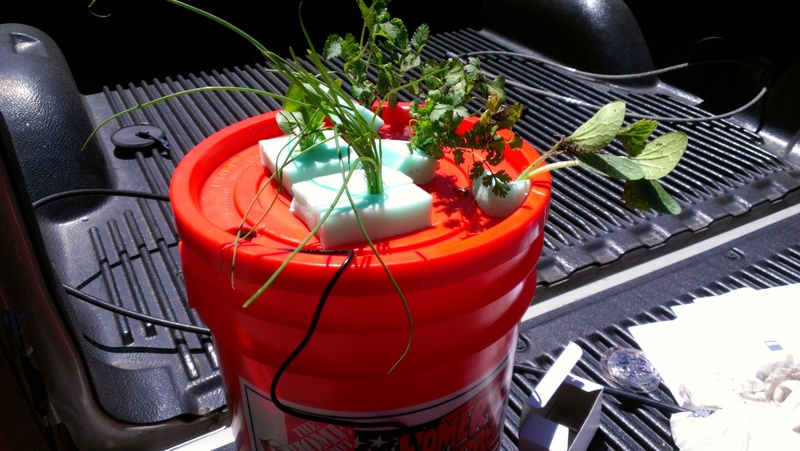 Did you take our aeroponics class at Workshop Weekend in June 2013? If so, we hope you enjoyed it! Please give us feedback, questions, or ideas and post a picture of your aeroponic garden. Tell us how your plants are doing. Did they recover from Plant Post Traumatic Stress Disorder (PPTSD)? If you think we did a good job, please recommend our class to your friends! I’ve got several pics of the areoponics system I built in class looks like you’ll have to find them on my Facebook page since image posting doesn’t seem to work here. Ive done just about everything the way you said it should be done and Ive looked up some supplementary material for a larger system that I think I will be putting together soon. I was amazed at how quickly these plants bounced back, though I did have to re-wash the lemon balm, and cilantro plant roots. Thanks for the opportunity to do this and for the inspiration as well. Hi, Ya’ll, while its only been two weeks there have been a lot of changes with the plants. I lost the lettuce, I think I let it get too much sun, but the squash, lemon balm, and green onions are going berserk, not so much the cilantro. I’ve tried attaching links to the photos I have but apparently I’m doing something wrong, I’d love to be able to share the progress this bucket has made in the last two weeks. I have learned through research that there were a few things that got left out in class but I don’t think they got left out deliberately I don’t think the length of the class allowed it. PH, Chlorine, and the timing of which nutrients to use and when among other things. Though I did catch that post on adding CAL-MAG to prevent blossom end rot, good catch there. Also where to buy, caus OSH doesn’t carry a single thing other than seeds that’s Hydroponically, or Areoponically oriented though there’s a lot of stuff you can adapt. There are a few Hydroponic specific stores in the area and hopefully they’ll have the stuff I need. Hi! 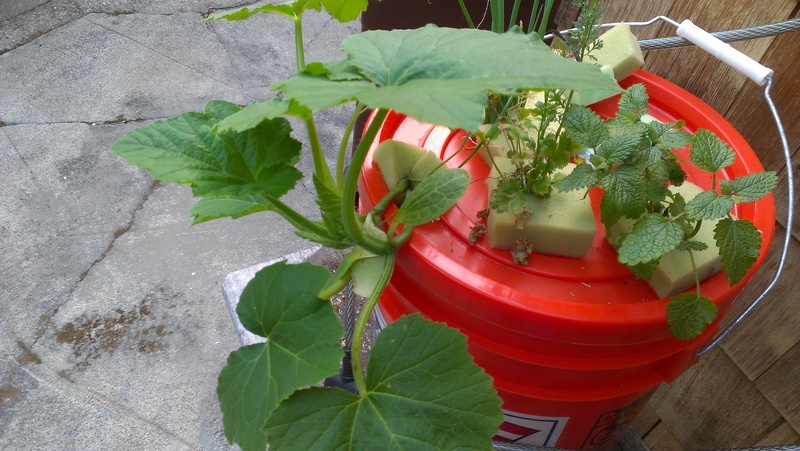 We are glad to hear that your squash, lemon balm, and green onion are doing well! We would love to see your photos. We will send you an email and try to get them posted here. Thanks for the feedback on the pH, chlorine, and nutrients. For “simple” plants like bok choy and lettuce, this hasn’t been and problem for us. 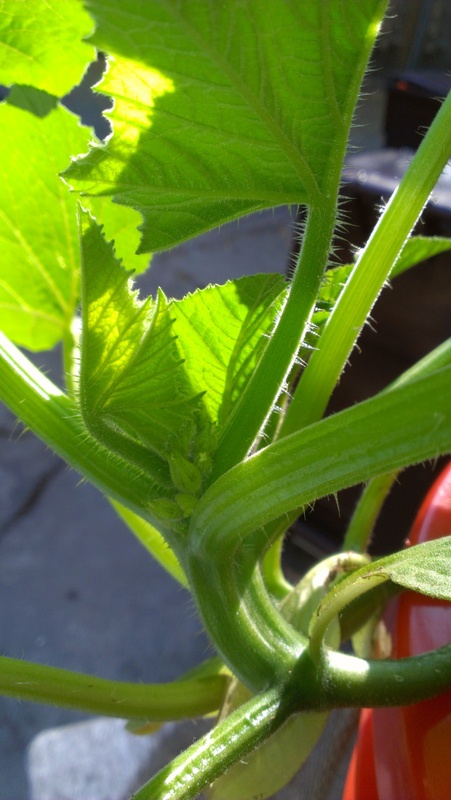 However, with fruiting plants, like the squash, it is a bit more complex. If you use the calculator for the system you built in class, you should fill out the calculator as follows. For nutrient system choose Flora Series; for system type select Recirculating; for reservoir size choose Three Gallons. There are several hydroponics stores in the area that sell the nutrients and supplements such as Berkeley Indoor Garden. You can also get most hydroponic supplies online. Thanks for your feedback! There is a lot of complexity to this and we do our best to summarize it, but there is room for improvement, so your observations are very important to us. We are looking forward to seeing pictures of your system soon! If you have any more questions or come across awesome resources, please keep us posted. Be Awesome and Carry On! Thank you for your pictures, James! We have attached them to this post. But some broccoli that I put in afterwards is growing well and the basil is great. I’m starting some Bok Choi to plant in it the next time around. I just changed the water for the first time – on schedule, but I thought I’d try liquid miracle grow. hope I’m not being too lazy there…. the box says its 12-4-8. 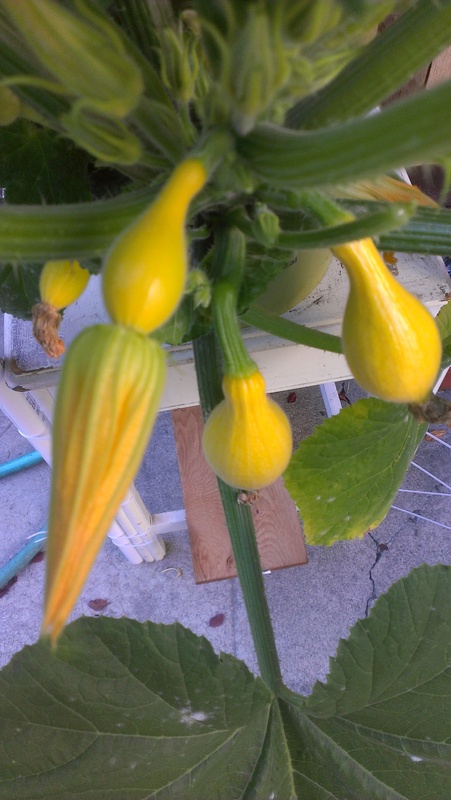 Although my plants are not growing super fast – maybe just 2 inches in the past month? The planter is right under the window and gets reasonable sun I think… any suggestions? Sorry that your system isn’t doing well. We have found that, with strawberries, you need to add a lot more of the bloom if you want any flowers or fruit. We will have to try broccoli next time; glad it’s going well. We have had lots of luck with bok choi, so that should be a good choice, although it may be seasonal (see two paragraphs down). Regarding Liquid Miracle grow– Miracle grow is meant to be a supplement, not a complete nutrient mixture. This means it does not contain the micro-nutrients needed for sustained plant growth. You might have trouble with flowering and fruiting plants, based on what miracle grow users have said. We have not tried it ourselves, and are interested to hear if it works for you. We have found that some plants might be seasonal and affected more by temperature and sunlight. Our summer bok choi is growing, but is not as robust as our spring bok choi. Beans, tomatoes, and squash are work well with us right now. Plants that glow sound cool… go ahead and shoot us an email. We also really like teaching our workshops, so let us know. Hope this helps with your aeroponic garden. Algae is a definite issue with these orange buckets, I switched to Echo Green buckets from OSH and now only my squash has Algae issues but only on the lid which is still orange. In my last update (Week 4 and beyond), yes that was supposed to be under this topic and not a topic in itself. Since then Ive made a few changes and now have two bucket systems one specifically for the squash, and the other for the Lemon balm, and onions, the cilantro is gone some sort of fungus and the Algae just totally rotted out the roots. While this does not by any means end this fascinating project it is sort of an important marker. Harvest, that’s right I’ve reaped the first fruits of my labors and it was good. The first fruit approximately 4 inches long and an inch to inch and a half around at its thickest. Raw it has very little taste but is quite crunchy, sautéed with olive oil and garlic salt it is just as good. As you can see by this picture I have several more fruit in the process of maturing I will let these sit on the vine for another week at least just to see how big they get. This plant is still drinking gallons of nutrient water a week and its root mass has reached epic proportions. If this plant were planted in soil in the same size container I’m sure it would not be doing as well nor be nearly so productive. 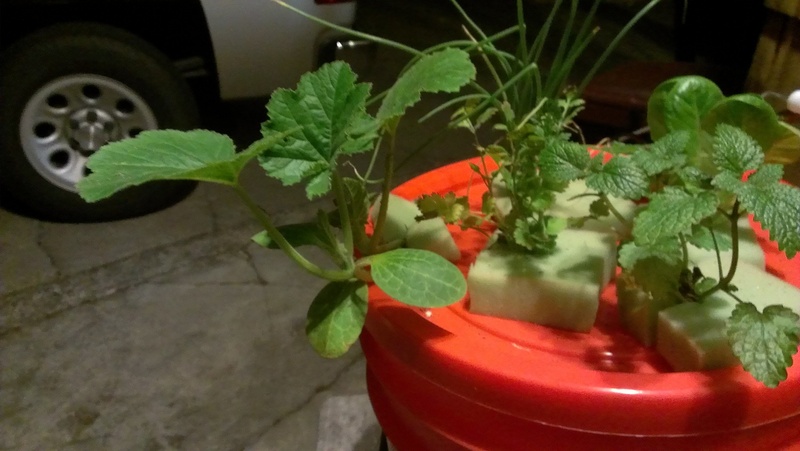 On the other hand the green onion, and lemon balm have developed impressive root systems of their own in their own lake of nutrient and are by far happier on their own than trying to share with the squash. Well it was fun while it lasted. My ultrasonic agitator gave up the ghost about a month an a half ago, I switched to air stones and my plant was perfectly ok with that. Unfortunately about three weeks ago I made a mistake I don’t know what it was or when exactly it happened and it didn’t effect the plant right away but sadly my yellow crookneck squash has died, it made a valiant effort and in the doing it produced 7 very respectable squash, over a dozen medium sized defaults that looked like they were going to be decent fruit but never made it, and nearly a hundred itty bitty babies that never got beyond a the half inch mark. It also produced a plethora of male blossoms that at times made it look like an orange fireworks explosion. Thanks to your advice I never saw a hint of blossom end rot and the only real problem I ever encountered after separating the original group of plants into different buckets was the algae. I knew there was no hope of recovery when I opened the bucket and found bright green algae blooms on the exposed portions of the roots. The lemon balm, and onions are still going strong, however, and I am hard pressed to keep the lemon balm trimmed back I suspect if I transferred it to a 55 gallon drum and left it alone I would have a lemon balm hedge very quickly. We are glad you enjoyed growing aeroponically! 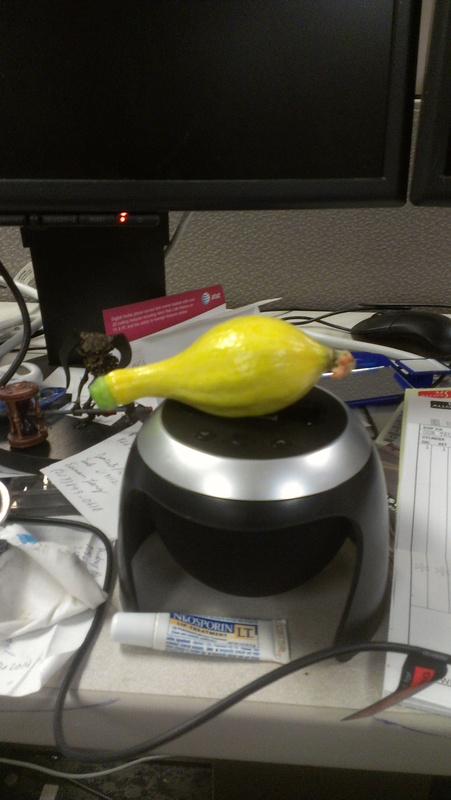 It seems as though you had a very productive squash plant and it is too bad that it died. For your fogger that stopped working, you could check to see if the vibrating disk is dirty. If it is, cleaning or replacing it (your fogger may have come with an extra disk) would most likely help. Dirt and algae may have contributed to your fogger problem. If you decide that you would like to try again, and want a new fogger, feel free to contact us (team[at]tribeawesome[dot]com). We buy them in bulk. I saw in your video that you have a timer to turn off the mister for periods of time because roots grow best when they are “dry”? is that correct? Also, i’m growing strawberries and they just don’t seem to be growing very well; i planted some in my hydroponics system at the same time and hydroponics are looking much better; one or two of the berry plants in my aeroponic system actually died already too… should they be in full sun? or partial sun? The forum ‘Aeroponics’ is closed to new topics and replies.